Has Make in India boosted FDI in manufacturing? 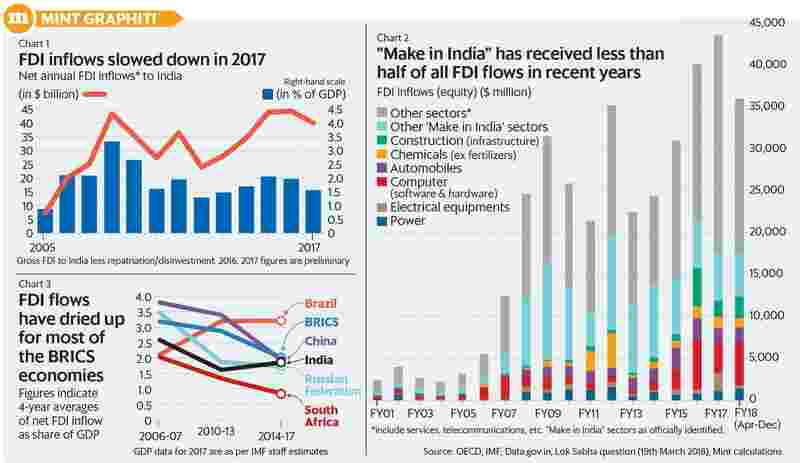 Bengaluru: Foreign direct investment (FDI) inflows to India declined in 2017 after having risen in each of the previous four years. Meanwhile the composition of FDI flows suggests that these would not be providing much impetus to government’s “Make in India" initiative (see Charts 1 & 2). Latest available data show that the share of FDI in equity in the initially identified sectors under “Make in India" was less than half in 2016-17 and 2017-18 (up till December 2017). Government had identified 25 sectors as “Make in India" sectors, including food processing, automobile, construction and mining. Out of these, available data for 20 sectors have been considered. However, a lot of the FDI in the above manufacturing-oriented sectors might not be “greenfield", i.e. not representing fresh investment. An analysis of FDI inflows between October 2014 and March 2016 by Biswajit Dhar and S. Chalapati Rao K revealed that only 1.6% of the manufacturing firms that received FDI during this period were incorporated post October 2014. Hence, for the remaining companies, the decision to invest had already been made or foreign investors had decided to take over or buy into the existing companies, the paper stated. The authors concluded that the “Make in India" initiative had minimal impact in attracting FDI for new projects in manufacturing. Thus, government’s target to increase the share of manufacturing in the country’s GDP to 25% by 2025 remains an uphill task. The actual share of manufacturing in GDP fell to around 16.6% in 2017-18, according to the official advance estimates, down from 16.8% a year ago. The seemingly lacklustre interest of long-term foreign investors in India’s manufacturing sectors is worrying because FDI is generally considered an important avenue for technology transfer. According to Biswajit Dhar, professor of economics at Jawaharlal Nehru University, “government had decided the sectors under the (Make in India) scheme but these may not be the priority sectors for the investors. If the government is expecting investment in manufacturing, it needs to address infrastructural gaps first." However, India is not the only country experiencing decline in FDI inflows. Most of the major emerging market economies too have experienced decline in their FDI inflows, when measured as a ratio to their GDP size. Due to the volatile nature of FDI flows, four-year averages have been considered (see Chart 3). After falling 18% in 2017, global FDI flows could come under further pressure in 2018 “as US companies repatriate cash due to the one-time tax on undistributed foreign earnings", said OECD in a recent report. Thus, the outlook on FDI inflows for India is now quite different from even a year ago, when investment banks were optimistic and some even predicted that it would reach around 2.5% of India’s GDP. FDI inflows to India as a share of GDP actually declined from around 2% in 2016 to 1.6% in 2017. The current slowdown in FDI coincides with concerns of slowing portfolio flows to emerging markets amid monetary policy tightening in the US. According to Ritesh Kumar Singh, a Mumbai-based corporate economist, slowing growth in net inflows due to lower FII or FDI inflows would be negative for rupee exchange rate especially when we have a high trade deficit.